It's a dark, chilly winter morning in Kankakee, Illinois. Most of the city still sleeps as you turn to park your Mercedes in the almost-empty employee parking area at Greater Kankakee Airport. You turn up your collar against the cold and carry your flight case toward the operations office. On the way, you detour as best you can around the remaining patches of last week's snow. You're a pilot for Lake Airways, a small commuter line operating in and around Northern Illinois. This week you have Flights 47 and 48, the morning round robin to Merrill C. Meigs—the small field with the single runway right along the shore of Lake Michigan in downtown Chicago. On the way, you notice your aircraft parked on the ramp in its boarding position, apparently fueled and ready to go. Kicking the snow from your shoes as you enter, you notice the outer door to the Lake Airways operations office has already been unlocked. The lights are on, but the single Lake employee who handles both the ramp and ticket counter chores at this early hour is not around. The small ticket counter and waiting area is deserted as well, although you know it will be buzzing with activity very shortly. You set your flight case down on one of the desks, hang up your coat, pull out your lapboard and charts, and take a seat. Flight 40 is a short and familiar hop, but you still do everything by the book. You plan to call for a full weather briefing, check the chart, rough out a flight log for the likely route, and skim the likely approach plate. However, because this is a scheduled flight, the “front office” has taken care of actually filing a flight plan. 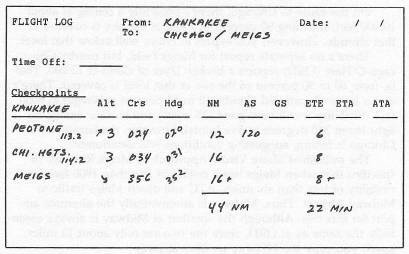 Since Greater Kankakee Airport has no control tower—so you can't reach any ATC facility by radio from the ground—you get your IFR clearance from the nearest Flight Service Station by telephone before departing. The clearance provides the frequency of the ATC facility to contact by radio after you have enough altitude, and the clearance itself automatically becomes void if you're not off the ground by a specified time. Your briefing notes indicate no particular weather problems for this flight, at least at the moment, but you also note conditions are gradually deteriorating. On the route to Chicago, there's presently a ceiling at about 10,000 feet, meaning 90 percent or more of the sky is covered at that altitude. However, you expect to cruise well below that level. There's no separate report for Meigs Field, but nearby Chicago-O'Hare (ORD) reports a broken layer of cloud at 12,000. That is, from 60 to 90 percent of the sky at that level is covered. There's also a layer of scattered clouds (10 to 50 percent coverage) at 8000 feet. 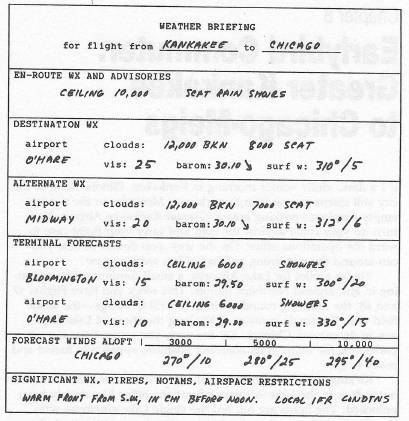 Visibility is still very good (25 miles) and surface winds are light (from 310 degrees at five knots); however, the barometer at Chicago is falling, suggesting conditions will deteriorate. 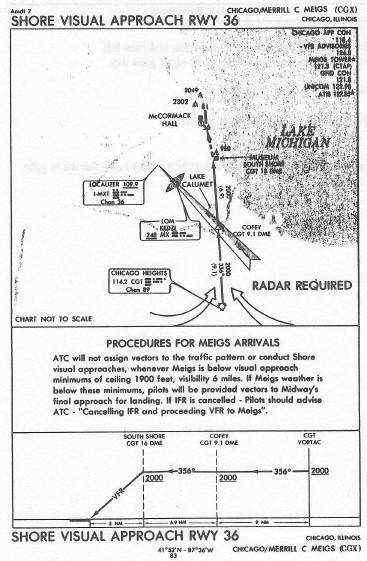 The published Shore Visual Approach to Meigs Runway 36 specifies that when Meigs has a ceiling of less than 1900 feet or visibility of less than six miles, ATC will divert Meigs traffic to Midway Airport. Thus, Midway is automatically the alternate airport for this trip. Although the weather at Midway is always essentially the same as at ORD, since the two are only about 12 miles apart, you copy the Midway weather anyway. Bloomington and O'Hare, however, forecast deteriorating weather. The warm front is moving up from the southwest, so ceilings are lower at Bloomington in the south. Local IFR conditions and rain showers probably will develop, but chances are you'll be on the ground in Chicago before the front reaches that far north. The surface winds seem negligible so far, but you'll have a light crosswind from the west (your left) while en route. Thus, to track a given course toward Chicago, you need a heading about three or four degrees to the left of the course desired. Although warm fronts generally bring rain, low ceilings, and poor visibility, the conditions presently forecast should offer no particular problems. In any event, you're always aware that aviation weather forecasts can easily go awry. The IFR clearance routing for this familiar flight is usually “direct Peotone direct Chicago Heights” at around 3000 feet—because the flight is short. If the wind is more or less from the north, as it is today, the Shore Visual Approach to Meigs Runway 36 is usually assigned. On occasion, however, a different routing is provided because of the weather or prevailing traffic. It's also possible—though unlikely—that you could be vectored to Midway instead of being cleared to Meigs. So, if the expected routing is provided, on departing Kankakee you simply home on Peotone; from there you proceed direct to Chicago Heights. Somewhere along that leg you can expect a clearance for the Shore Visual Approach, which starts from the Chicago Heights VOR, so you glance over that approach plate now to brush up on the procedure. The Lake Airways ground attendant comes aboard, indicates that all passengers and luggage are aboard, and hands you your clearance received from Flight Service by telephone. Clearance void if not off by 0730. Com radio on 123.0 for Kankakee Unicom. Kankakee Unicom, Lake Airways Forty-Six, good morning, which way please? Lake Airways Forty-Six, Kankakee Unicom, good morning. Ah, just try to drive between the little blue lights, okay? Lake Forty-Six, Kankakee Unicom is just kidding. We're using twenty-two, but there's no traffic that I know of. Kankakee, Lake Forty-Six, thanks and have a good one. Squawk two five five five. On one one eight point four good day. Expect Shore Visual Approach Runway 36. On one twenty-one point three so long. Contact Ground on one twenty-one point eight good day. You're cleared to terminal Gate 6. Taxi to the terminal and park at the usual Lake Airways gate.